Former Hatters striker Mark Cullen came back to haunt his former side with a hat-trick as Luton let a 2-1 half time lead slip to suffer defeat in their League Two play-off semi-final first leg clash at Blackpool this evening. Town had looked like they were on their way to taking a precious advantage back to Kenilworth Road after swiftly replying to Cullen's opener, moving in front through Dan Potts and Isaac Vassell's quickfire double. 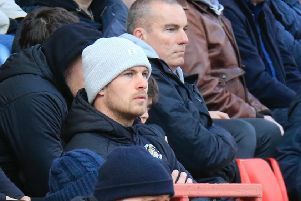 However, Cullen, who left Kenilworth Road for the Tangerines for £180k in the summer of 2015, then curled in magnificently from 25 yards immediately after half time and converted a controversial penalty on 67 minutes later to ensure Blackpool will lead the tie going to Bedfordshire on Thursday night. Much of the discussion will be about referee Nigel Miller though who made a number of baffling decisions throughout, and also waved away two late shouts for a Luton spot kick, to incur the wrath of the hordes of travelling supporters as he blew for full time. Luton boss Nathan Jones made three changes, leading scorer Danny Hylton recalled as expected, while James Justin recovered after being stretchered off against Morecambe last time out to take his place at wing back. Alan Sheehan returned too, with Lawson D'Ath starting, meaning Jake Gray, Ollie Palmer and Luke Gambin all dropped to the bench as Town settled well, Hylton and Isaac Vassell linking up promisingly in the early stages, the latter seeing one blast charged down. Out of nothing though, the hosts went in front on 19 minutes, with a desperately poor goal that was hugely avoidable for Luton. A ball in rolled under the foot of Olly Lee and Kyle Vassell's deflection landed perfectly for Cullen, whose low effort had just too much on it to beat Stuart Moore and find the bottom corner. Moore had to repel Neil Danns' blast as the Tangerines searched for a second, but Town got the quick response they were after when D'Ath fed the overlapping James Justin on the right. Although his cross was missed by the usually predatory Hylton, Dan Potts raced into the box to side-foot in off the underside of the bar for his first goal in Town colours. Kyle Vassell sent a curling strike inches over, before Luton were in dreamland as Hylton and Pelly-Ruddock Mpanzu had shots blocked, before Justin teed up Isaac Vassell to slam past Sam Slocombe and make it 2-1. Blackpool's Vassell looked a danger from range, forcing Moore into a low parry, as did Brad Potts when closer to the target, while Vassell headed over from a corner too. Mpanzu almost had a say at the other end, reacting first to blocked Hylton attempt and seeing his drive deflected over the bar for a corner. Any instructions Jones may have sent his side out with for the second period were swiftly out of the window when Cullen had his second just two minutes in, curling a glorious finish beyond Moore and into the top corner. Cuthbert then kept it level as Jack Payne spotted Kyle Vassell's run with a lovely chipped ball but just as he was about to pull the trigger, the captain saved the day. Moore had to be alert to save from Danns again, while Robertson should have made it 3-2 as a free kick landed at his feet just six yards out, only for the defender to sky his shot. Town were still a threat though, Cuthbert meeting Sheehan's corner, with Slocombe comfortably holding on. However, the game was turned on its head once more, after an astonishingly bad decision from official Miller, who gave a free kick against Justin for what a perfectly executed tackle on Danns. From the resulting set-piece, Cuthbert's clearly held Aldred back which was spotted by Miller with the official whistling for a penalty that Cullen tucked away for his hat-trick. Town then had plenty of the ball in the final 15 minutes, throwing on the in-form Marriott in their search for a leveller, but any measured attacking play from the first period was gone now, utilising a more direct approach. It did lead to the odd chance though, with the visiting fans screaming for a penalty on 80 minutes when Hylton went over in the area after a push by Aldred, as Miller shook his head much to the frustration of the travelling supporters. Brad Potts sent a rising effort over and Sheehan hooked a volley narrowly wide, before in stoppage time Hatters had further cries for a spotkick for not one, but two handball shouts, with Ollie Palmer adamant it was a penalty, before home keeper Slocombe pounced. Luton now have four days to recuperate ahead of the second leg and although they will be left bitterly frustrated by the result, this tie is far from over. Blackpool: Sam Slocombe, Kelvin Mellor, Andy Taylor (C), Clark Robertson, Will Aimson, Kyle Vassell (Nathan Delfouneso , Brad Potts, Mark Cullen, Tom Aldred, Jack Payne, Neil Danns (Jordan Flores 80). Subs: Dean Lyness, Eddie Nolan, Bright Osayi-Samuel, Armand Gnanduillet, Ian Black. Hatters: Stuart Moore, Glen Rea, Stuart Cuthbert, Alan Sheehan, James Justin, Olly Lee, Pelly-Ruddock Mpanzu, Lawson D'Ath (Ollie Palmer 85), Dan Potts, Isaac Vassell (Jack Marriott 74), Danny Hylton. Subs: Craig King, Stephen O'Donnell, Jonathan Smith, Jake Gray, Luke Gambin. Booked: Sheehan 63, D'Ath 77.